The Seahawks' running game was stronger than ever, and Bobby Wagner went off again. But there were some serious flaws in Seattle's win over the Vikings on Monday Night Football. The Seahawks’ playoff formula now is a really simple and appetizing one — beat the 49ers next Sunday in San Francisco and they are in. That would clinch either the five or the six seed, which is all Seattle can get with the Rams winning the NFC West, and would mean the last two games of the season would be pretty meaningless. But considering where many thought Seattle would be when the year began — and where the Seahawks appeared headed at 0-2 — it’s more than good enough. Seattle is almost certainly going to be playing in January and that alone will give the Seahawks a passing grade this season. And if the 21-7 win over the Vikings on Monday night was less than artful, the Seahawks get a passing grade for that, too. This was not Russell Wilson’s best game. In fact, it might have been one of his worst — he had a career-low 72 passing yards and a career-low 37.9 passer rating. And the interception near the end of the first half was inexcusable. Wilson has largely eliminated those kinds of plays as the season has worn on but he reverted to old bad habits at the worst possible moment. 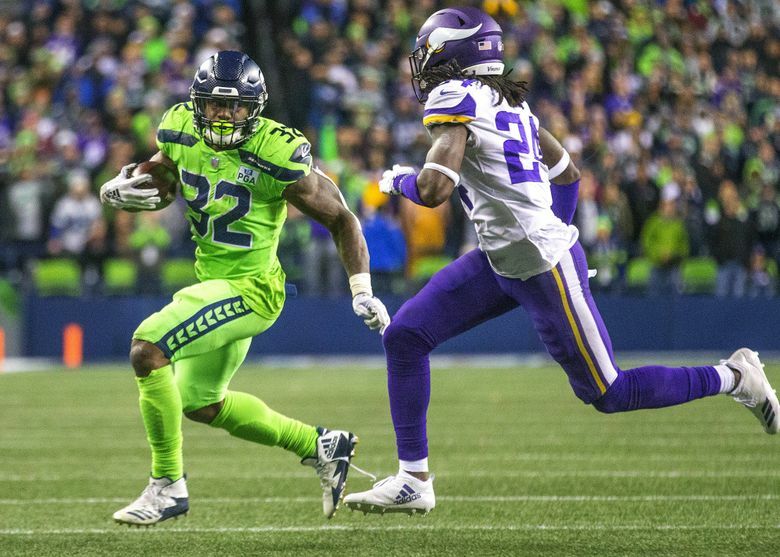 However, Wilson also showed what makes him so special with his 40-yard run that got the Seahawks out of bad field position at a critical time and set up their only offensive touchdown. Seattle’s runners continue to produce. The line helps too, but Chris Carson and Rashaad Penny also again made a lot yards on their own. Carson had a particularly gutty effort, shaking off the dislocated finger of last week to carry it 22 times for 90 yards against one of the toughest defenses in the NFL. The Seahawks seemed to definitely miss the injured Doug Baldwin, as Wilson seemed to often either not find anyone open, or not find anyone open enough to want to throw it. David Moore also had a drop and couldn’t get both feet in on an possible touchdown in the second quarter on the drive that ended with the interception. There were just six receptions by a receiver — five by Tyler Lockett. Seattle’s tight ends were not a huge factor on a night the offense was often crying out for any kind of yards. Seattle needs to get Ed Dickson going again — he has tallied just three catches for 17 yards over the last three games. The running game was solid throughout and that makes this another more-than-passing effort for the offensive line. The Vikings got pressure on Wilson at some critical times, with Germain Ifedi beaten bad for a sack by Danielle Hunter in the first half. And there seemed to be some miscommunication on a third down Wilson run that came up far short. That said, Seattle’s 214 rushing yards were the second most of the season. Seattle’s top two rushing efforts have now come in each game that Jordan Simmons started in place of D.J. Fluker. Frank Clark and Jarran Reed continued their fine seasons, with Clark getting his career-high 11th sack of the year and also helping make the play on a critical fourth-quarter fourth-and-1 stop. Reed had just one tackle, but was a steady force with his penetration. And rookie Jacob Martin continued his surge with the sack and forced fumble that resulted in a touchdown. Bobby Wagner continues to come up huge with a team-high nine tackles and a quarterback hit and a blocked field goal. Mychal Kendricks returned and got the start at weakside linebacker. He had five tackles and seemed to help solidify things overall. The defensive backs may have been tired of hearing about their tackling and coverage issues from a week ago against the 49ers. Except for a couple of plays, Seattle’s secondary was almost perfect against a pass offense ranked seventh in the NFL. The Seahawks held Vikings receiver Adam Thielen — who entered the game with 98 receptions for 1,166 yards — to no catches and no targets in the first half. Minnesota coach Mike Zimmer said later Seattle’s plan appeared to be to double team Thielen and Stefon Diggs and force the team’s other receivers to make plays. A couple of critical drops by other Minnesota receivers further proved the worth of that strategy. Shaquill Griffin and Tre Flowers were particularly good in tackling, both in the pass game and on running plays, and Bradley McDougald broke up a critical fourth-down play from the 1 in the fourth quarter. The Seahawks also unveiled a package with seven defensive backs on a few plays, and on one early in the game cornerback Akeem King blitzed to force a third down incompletion. Coach Pete Carroll said it was essentially a revival of the team’s “bandit” package it used a lot in 2010. Wagner’s leap-and-block is just another of the slew of game-changing special teams plays the Seahawks have made all season. Sebastian Janikowski made two field goals, which each seemed huge at the time.